I'll keep the intro short and to the point. I'll give background in a follow-up post and get straight to business here. Note: all safety is up to you to figure out and be responsible for. Metallica didn't write the lyric, "fuel, give me fire, give me ..." if fuel didn't give fire. So be careful. 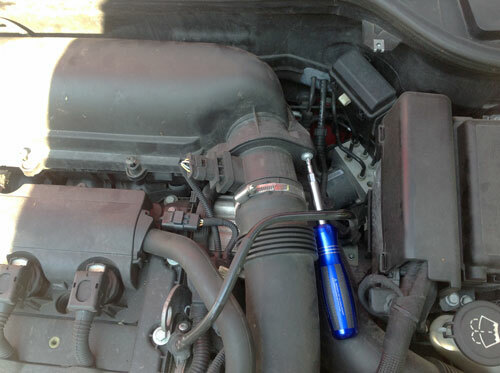 Also Note: I did this on an engine that hadn't been turned on in a day or two. I recommend working on a cool engine. Noteworthy: the Bentley book recommends steps that I personally thought were unnecessary and that involved lifting the car. I did not do it that way. 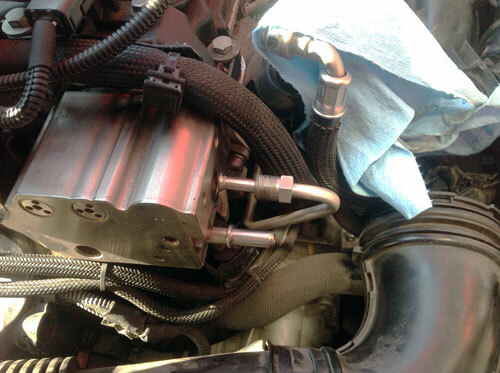 I kept it as simple as possible and did none of the removal of the intake manifold or replacement of the fuel line. Help Improve This "How To" Guide: If anyone would like to add polish to this tutorial for the benefit of future users, just post comments, and I'll update the post. I'm terrible at auto mechanics, and people deserve better than me making a tutorial by myself lol. This post will be updated based on user input. All updates will be marked in red. They had it $55 cheaper than Pelican Parts. Shipped day after I ordered. Arrived 2 days after for 3 days turn-around on $14.12 shipping charge. Better than expected delivery time for sure! "A failure to plan is a plan to fail." Here's the list of stuff you need, so that you don't have to make 2-3 trips to Lowe's or an auto parts store like I did midstream. If you have this stuff up-front, this should take a pro 20-40 minutes. 12mm Crow foot socket bit (link to examples thanks to nine5raptor!). I was able to pick up a set for ~$20 at my local auto store. There is a single torx screw (I think it is T15 or 20) on the front left side that you need to unscrew. The rest of the feet basically pop out. 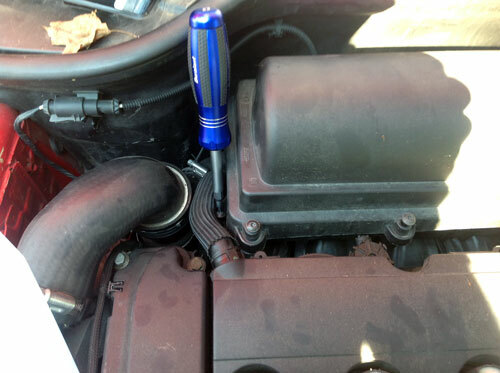 Unscrew the two screws that hold the top hose that runs into the air box. The bottom hose just comes out no screws. Note: I moved some hoses out of the way as best I could. You disconnect stuff as you think you need room to work. Note: There is an object that seems to be in the way of accessing some of the screws. I have no idea what it is, but it's essentially a vertical plastic post that stands vertically in front of where the HPFP is. In order to move this out of the way, You have to lift up (see pic) on the object. It has two "feet" posts that slide up and out of two holes below it. By lifting it up, it lest you flex the part out of the way. During reassembly, all you have to do is make sure to realign these feet in order to get it to slide back down. The Bentley book refers to both lines as the "fuel line," so I don't know exactly what's going on with that. I'll update this part if anyone has comments to specify here. The right line has a special head on it that according to the book says it needs the "MINI special tool 13 0 250." I couldn't find that anywhere, so I figured it couldn't be too hard. My "special tool" was a 1/16" punch, but you can probably use a ballpoint pen. There is a black pin on the passenger side of where the special part connects to the HPFP. The other side has something like that as well, but it doesn't depress. It's fixed in place, so don't worry about it. To remove the line, you have to depress the left pin with the punch first. While keeping it depressed, pull the connector towards the HPFP, and then pull it off. You can't straight pull it to the rear without first pushing it forward. It comes off very easily. There was a little fuel that came out, but I had a tray under the car to catch any spilled oil, and it didn't get a drop on it. It's recommended to cover the lines to prevent contamination. Note: ECS posted here a link to the actual special part. So not necessary IMO, but I added the link for a reference since they were so helpful to find it out. So there's a narrow, metallic fuel line that runs into the HPFP to the left of the other line, and I used a crescent wrench to remove it. This part is pretty straightforward. Note: since I have no idea how to actually get a torque wrench around a nut that has a fuel line running through it, I tightened until it seemed pretty tight. I then referred back to a photo I took before removal to confirm it looked the same. This takes a T30 torx ratchet bit (see picture below). I used the pictured 1/4" drive torx ratchet bit on a narrow 2" extender and a bit that allowed me to use this on a 3/8" ratchet in order to remove these screws. They aren't easy to get to, so this 1/4" drive bit and extender were critical. I tried removing them with my torx screwdriver set, and I simply didn't have the leverage via grip strength to undo them. I put all these screws in my part tray. Pretty straightforward. It's the black plug below the fuel lines. Rotate the drive on your new HPFP to match the same angle as the one on your old part (my thumb on the above pic is touching the drive piece). The drive is what connects to the groove on the intake camshaft. You won't be able to get the part in if it isn't aligned properly. You can eyeball it from the outside, but using the old part as a reference helped me quite a bit. Note: the book says coat the fuel line in transmission fluid. 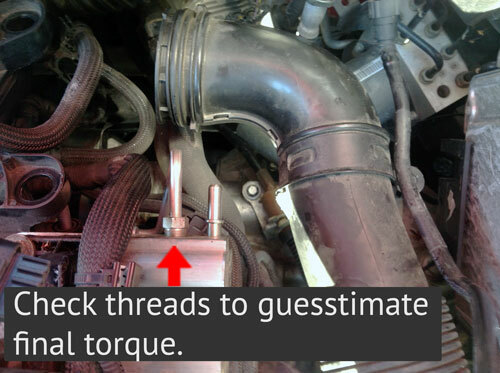 Don't worry about torque yet. This is where the drive's position comes into play. 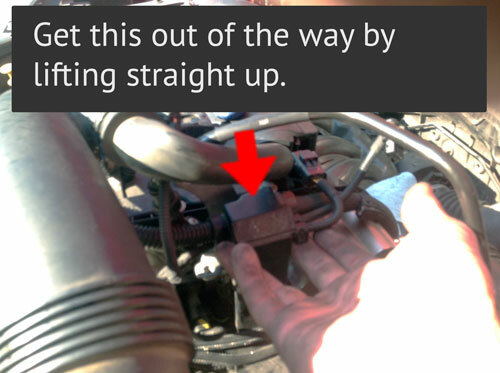 If it isn't aligned with the groove on the intake camshaft, just play with it and it will work out. 12 - Hand tighten the screws back in place connecting the HPFP back into place. Get your torque wrench, and according to the book tighten the screws that attach to the engine to 8.1 ft-lbs. Refer to the torque data section for what the Bentley book provided. My wrench is a 10-100 ft lb. I went to 10 and stepped it down to 8.5. The book says tighten stage 1, 2 and 3. UPDATE: Thanks to nine5raptor who identified the tool I was lacking to properly torque the fuel line nut. I picked up a 3/8" drive metric Crow Foot set at my local auto parts store for under $20. The link nine5raptor provided is here to see what options Sears has. You need the 12mm wrench, but they basically all come as a part of a set. Proper torque will not be possible without this tool. So get a kit. See the torque section at the top of this for the proper torque settings according to the Bentley book. For that annoying vertical black post right in front of the front two screws of the HPFP, just remember to make sure the two feet fit back into the grooves. I had trouble getting anything to happen for probably half a dozen starts. I don't know for sure that this does the trick, but while the car was giving me trouble starting while the pump was bad, one thing that helped get it drivable was to go ahead and put it in gear and the second it starts up, go ahead and give it gas in reverse/1st gear. This got it started perfectly for me. Idle runs fine. I hooked up the OBD2 scanner, cleared my codes. No new error codes. Took her for a test drive. She finally can generate mean torque again. So happy it's done! // 1 - For the N14 engines (including mine), warm up the engine for 5 mins. 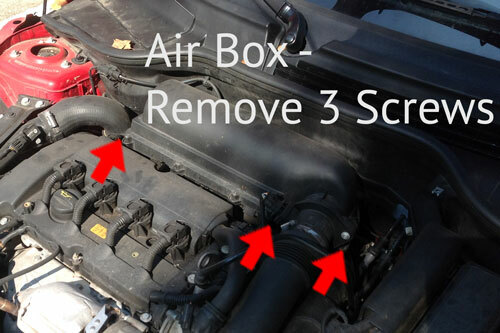 // 3 - Repeat step 2 - remove air box in order to gain access to the fuel line nut. // 7 - Start her up to make sure she works. Last edited by Sandwalk3r; 07-12-2014 at 01:13 PM. I kept the DIY how to pretty to the point. I'm bad about writing too much, and I didn't want to intro the piece with too much text. But here's the background and other things I wanted to include. Thanks to everyone who is helping to identify errors or provide solutions to problems I had when originally going about this process. I have made a couple of updates already, which are highlighted red. 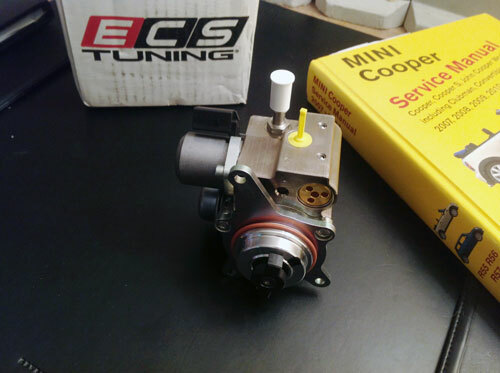 If you don't have an R56 JCW, then you can probably get a new one installed free by MINI, even if you're beyond your warranty. For the main HPFP thread, see this link for the greater discussion of the issue. 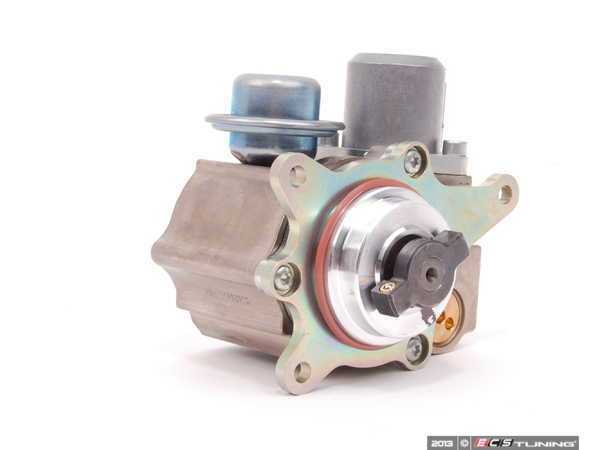 The High Pressure Fuel Pump (HPFP) issue is a problem that apparently a lot of the R56 owners have. There's that day that you go to start your car and it just coughs and dies. Yes, MINI has apparently in acknowledgement of the problem offered to extend a courtesy and replace this part up to 120,000 miles. Mine went out around 70,000 miles. The problem according to the dealer is this is a "VIN-specific" issue, where their courtesy "extended warranty" for this part is only for specific VINs. I got the dealer to check on that, and the word on the street was that this "campaign" - a term he had to retract, but that said it all - is basically being offered to everyone in the R56 family UNLESS you have a JCW. My thoughts are it's turbo-related, and JCWs must worsen the problem. So I was out of luck. And since almost everyone gets theirs replaced free, there weren't any tutorials I could find on how to do this. To put this out there up-front, I'm an auto mechanical noob. 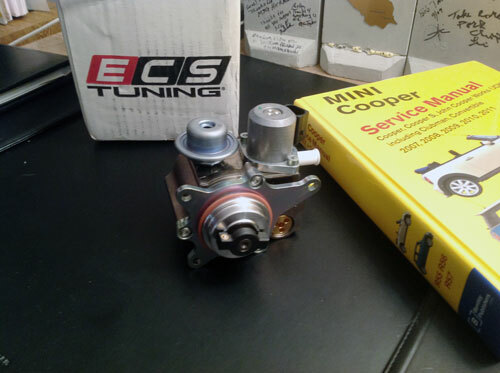 I replaced my timing chain tensioner when that problem flared up thanks to the advice and tutorials on this forum. But the lack of any available tutorials made me a little scared. I just didn't want to pay MINI $100 to "diagnose" the issue, then pay them $900ish for a part (according to intel provided by Systemlord) and then who knows what for labor. Thus I'm putting this tutorial up. It's mostly out of appreciation to this forum for how helpful it has been to me as someone who isn't great at auto mechanics yet wants to stretch a dollar by utilizing my "free" personal labor. I bought the Bentley book on R56 a while back, and the process it outlined seemed way too involved. I didn't want to lift the car onto blocks to mess with the fuel line. So I figured there had to be a better way. This isn't hard. It's pretty basic. All you need is the part & make sure you have the right tools (see checklist). If I didn't need to make runs to Lowe's, I could have been done in under an hour. So if you're far better than I am, it could possibly take you 20-40 mins. I had my dad there to help me, but you could do this solo. Thanks to Th3Stig, digolfa, Huckleberry 254, d.ryan1114 and Systemlord for helping me sort the issue out when I was starting out with nothing but pure frustration at a vehicle that wouldn't start on the morning where I had an important sales meeting! 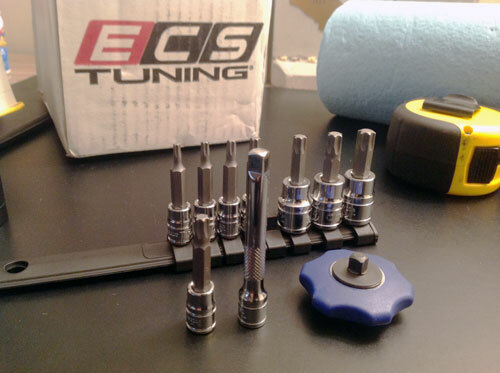 Also thanks to ECS tuning for adding to my original thread and offering help during the process ... and for ultimately providing the best price and a great turn-around time. Since I have benefitted from the work others have put forth on here, I'll check back in to update and polish this tutorial if it gets any traction. If you have tips to polish part names or how to make this more user friendly, I'll gladly update this to be a resource to anyone who finds themselves up a creek without a paddle in the future. Last edited by Sandwalk3r; 07-12-2014 at 01:07 PM. Excellent tutorial, give yourself more credit. You saved me $100+ dollars, no need to buy the special tool now! I contacted Mini USA to inquire about this HPFP campaign a week ago and they told me that my VIN is included for the HPFP warranty. No doubt I'll have to replace it sooner or later, we'll see. I'll most likely just replace it myself because I'm not too thrilled about the inconvenience of having my Mini sit at the dealer until they get around to installing it. Definitely no need for the tool IMO. 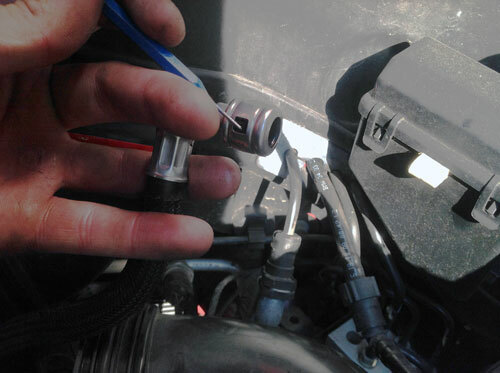 It must be something that meets requirements to minimize potential leakage from the fuel line. Proven though some fuel did leak, nothing dripped down into the pan waiting to catch leaky fuel. Like i said, the users on this site have been incredibly helpful to me, so I had to write something up given a lack of any existing instruction. And thanks for your contributions to my original thread. Getting the correct diagnosis is the first big step, and I would have never made it without that thread. Super job on the writeup! Just a comment on your fuel line torquing. The item needed is called a crow foot wrench or crow foot socket. Basically, as you said, it is a open end wrench for a socket driver. Ha! I hadn't checked back to see if anyone had done anything with their own HPFP issue since before you wrote that post. Did you have the crow foot wrench already? The guy at Lowe's looked at me like I was stupid when I asked if he knew of any way of getting some sort of bit that was an open-faced wrench onto a socket torque wrench. That was the biggest hangup for me. And the stuff about the intake manifold and fuel line replacement - I agree. Seemed unnecessary to me. Agreed, I have never heard of anyone needing to replace the high pressure fuel lines, I have never had to on all my other cars and trucks I have owned in the last 25+ years. They can last beyond the life of the engine. Great tutorial! Thanks for taking the time to post this! Great job on the write-up. I had mine done under warranty at 118k, so hopefully it will be a while before I have to deal with it going out again (if ever). Plus, I have the Bentley manual. Still, I find these write-ups from fellow owners to be excellent sources of guidance since they often come from the perspective of someone like me - trying to figure things out on the fly. Will definitely refer to this if the need arises. Thanks!!! This thread needs sticky status, God forbid this thread get buried in all the other threads! This thread is a tool in itself. Did you have the crow foot wrench already? Yeah, tools I have. Skill and patience, not so much. I don't know whether to trust the torque wrench when using any type of offset like a crow's foot or an O2 sensor socket. Always seems to me I'm losing some efficiency there, so should aim for a higher setting on my torque wrench. Maybe some engineer can tell me otherwise. Ideally, yes you adjust for the torque wrench adaptor since the wrench is based on a predefined distance in the calculation 'torque = force x distance'. When you lengthen the distance, the gauge reads higher than actual which means your actual torque is lower than selected (selected = gauge). Usually, the torque wrench is much longer than the adaptor which lessens the % error but good to consider. In my case, I also need to recalibrate my wrench as it has been some time and I know it has drifted off. You are welcome, glad I could help. Awesome, nice step by step. Congrats on a job well done. Great write-up! We probably did the same job on the same weekend because I was looking for a thread just like this before I changed my pump a few days ago. What OBDII scanner did you use to clear the codes? I've tried two different readers and neither will clear my codes. Might take a couple times to clear codes. Some of the OBCII Actron units are slow and take a couple times when I used them. They like to not communicate on the first try. 13517588879 is that part above. If you don't see , missed the hypertext link above. Last edited by ECSTuning; 09-10-2018 at 11:43 AM. Great writeup! I enjoyed the read. If I ever need to replace my HPFP (already done once under warranty) I'll come straight to this thread. I didn't know what a crow's foot socket was. That was interesting and I always wondered how to torque down a bolt with a line on it. I should have known from looking at an oxygen sensor socket, but that makes sense. Thank you for taking the time to do an excellent write up! I fear that I will be doing this soon as well. Although my car meets the VIN specific warranty requirements, the dealer dodges the issue every time, wanting to fix this and that, instead of replacing the pump. Car seems to get worse and worse, week by week. Sub'd, since I have a JCW and will probably have to do it. This is a great writeup. Well done! I know that when I had my HPFP done under warranty the cost was ~$1300. Someday you'll save someone a grand. I'll be bookmarking this thread for certain. Well done. An awesome resource for this community. My 2011 "Cooper S Clubman" just went into the shop yesterday and was told that it has a failed HPFP. I ran across this thread (since I was out here reading about the chop top R56) and promptly called Mini USA to check warranty status on my HPFP. They said, based on my VIN, it wasn't covered, but they're going to be contacting the dealership, and "working with their team" to see what they can do about the cost. I needed a VANOS and HPFP replaced and I was quoted $801. We'll see if that changes...crosses fingers. 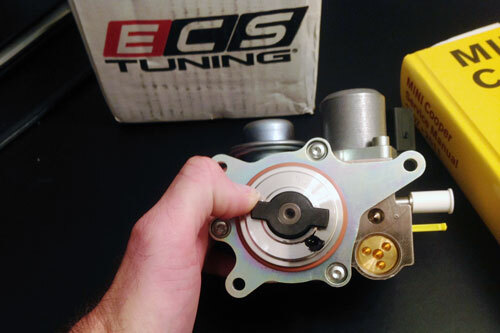 You could save hundreds of dollars (by switching to GEICO in just 15 minutes) buying the parts from ECS Tuning. Yeah, I agree, especially after reading this. I had thought I was going to do the work, but after going to Oreillys Auto Parts, getting a code (P056 I think, listed here so Google can pick that up) relating to the throttle position sensor, replacing said TPS to the tune of $140 (OEM Bosch) and then fiddling with trying to figure out which one of the two was bad...and then reading horror stories about timing chain issues...I figured I'd have them take a look instead of this amateur. I just started developing sputtering on start issues on top of the issue that caused it to go into "less performance" mode, so it wasn't obvious that this was just one issue, and I had a hard time telling if it was something significant or not. So...off to the dealership! Sometimes it's better to get a proper diagnosis because the gas pump inside the gas tank do go bad, just not as much as the HPFP. You need to find out which of the two pumps is faulty. Let us know what the dealer says. Last edited by Systemlord; 09-24-2014 at 06:10 PM.